Undersheriff Tim Murakami with Sheriff Alex Villanueva. 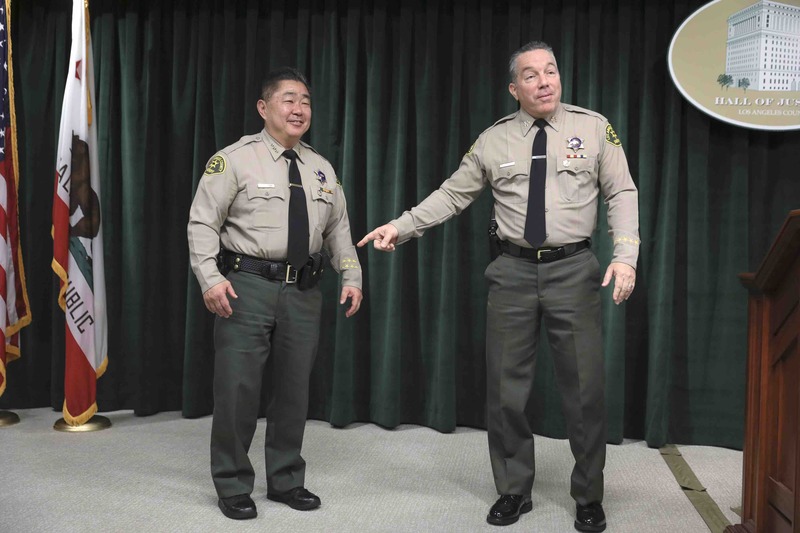 Timothy Murakami took over as second-in-command at the Los Angeles County Sheriff’s Department on Monday. 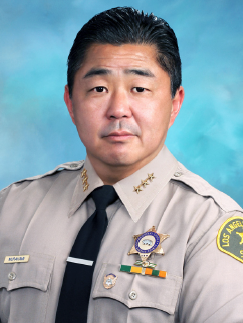 Previously assistant sheriff, Murakami will serve as undersheriff effective immediately, according to LASD spokeswoman Nicole Nishida. He replaces Ray Leyva, a department veteran who had come out of retirement to help incoming Sheriff Alex Villanueva’s transition. Leyva told ABC7 that he was informed of the staff change by Villanueva on Monday morning. Villanueva took office in December after defeating incumbent Sheriff Jim McDonnell in a runoff election. Murakami, who had been in charge of patrol operations, was promoted from captain to assistant sheriff by Villanueva. In 2013, Murakami was promoted to captain by then-Sheriff Lee Baca and assigned to the Industry Sheriff’s Station. His career with the Sheriff’s Department began in 1979. After graduating from the Sheriff’s Training Academy as a deputy sheriff, he was assigned to Men’s Central Jail, East Los Angeles Station, and Personnel Administration in the Recruitment and Pre-Employment Investigation Units. Upon his promotion to sergeant in 1992, Murakami was assigned to the Sybil Brand Institute for Women, Pre-Employment Investigation Unit and Industry Station. As a sergeant, he assisted in the formation of the Asian Crime Task Force, which investigated Asian gangs and organized crime. Murakami was promoted to lieutenant in 2000 and assigned to Industry Station, Cerritos Station and Temple Station, where he served as the Rosemead Lieutenant and soon became the “Chief of Police” who was responsible for all city public safety services, including code enforcement and animal control. This unique “Rosemead Model” blended department and city services under a unified command, which resulted in major crime reductions and improved quality of life for residents. Murakami holds a bachelor’s degree in criminal justice from California State University, Los Angeles, with Honors at Entrance and membership in Phi Kappa Phi Honor Society. Murakami and his wife Norma are residents of San Bernardino County. They have four children and 14 grandchildren.